York River Yacht Club (YRYC) cruisers held a 14-day round trip cruise from York River Yacht Haven to Baltimore. 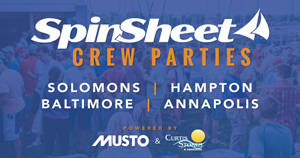 Many of our Club Crabtowne members are excited about participating in more sailing events. To get in on the action, simply join our club on Meet-Up and sign up for activities. Every day is a good day on a multihull, so here’s a little sample of a day in the life. SpinSheet Century Club members Charlie and Cathy Simon complete the Northwest Passage on their 58-foot Taswell Celebrate.